Luckily my GPS records my every movement on two wheels so its quite easy to upload a log of where I have been to try and prepare my dodgy knees for the trip. Below a weekly log of my training miles will be appearing. Click here to see the bike specification. Before this log I have been cycling regularly to work (approx 6 miles per day) for about 8 months as well as occasional longer weekly 10 mile runs, this log marks the start of the more "serious" training I need to do to stand a chance! The black line is the turn around point by Hungerford garden centre, you see the speed drop on the return leg due to wind. The top graph shows the elevation (note Fishers Lane!) the lower graph shows speed. Cold Ash, Yattendon, Frilsham, Bucklebury 12 mile mountain bike cicuit. 1 hr 10. Snow and ice have put road training on hold for the past week - very frustrating. Now using the exercise bike which is certainly not as fun (very boring and uncomfortable) so have been doing short 10k sessions - record so far 16mins 20secs. Investigating buying a turbo trainer which I can attach to a normal road bike - I need to wear the saddle in! Cold Ash to Wantage on B4494 and then back via A338 to Hungerford, turning off to go via Speen. 36.1 Miles: 2hr 48 : ave speed 12.8 mph : max speed 30.5 mph. Icy roads to start with lead to a slow speed but once out on the open roads with the sun shining it was a lovely ride. Just before the descent into Wantage it was a fantastic view over to Didcot Power Station. Saddle not too sore now but need to take a second drink container. Longest ride so far. 7 mins faster than 2 weeks ago. Total 60.5 miles for the weekend. What did i say about not being sore??!!? 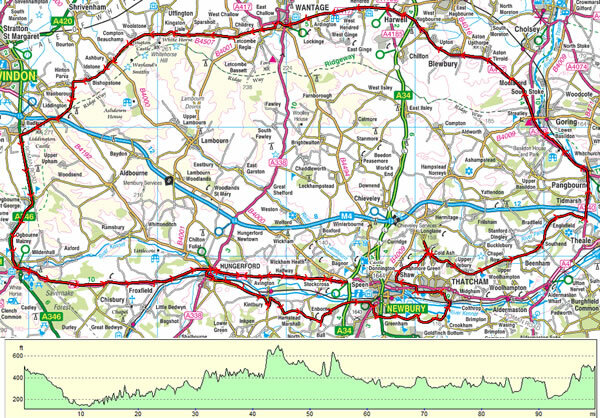 Cold Ash to Shefford Woodlands B4000, Hungerford A338, Kintbury, Newbury. 34.15 Miles: 2 hr 12 mins: ave speed 15.4 : max speed 33.3 mph. Blue sky, 10 degrees, light winds, not too many hills, perfect! Cold Ash to Bradfield, Theale, Aldermaston, Tadley, Brimpton, Thatcham. 31 Miles: 2hr 7 mins: ave speed 14.3: max speed 33.7 mph. All started well with an ave speed of 19 mph when going past Bradfield sports centre - mostly down hill though from Cold Ash. Turning up to Aldermaston into head wind all the way home slowed things up. Lots of stop starts and a few getting "lost" moments!. Dry and blue sky though so all in all ok.
Total 65 miles for the weekend. Not as sore as last week! Cold Ash, Andover to Marlborough. 61 miles: 4hr 9 mins: ave speed 15.1: max speed 33.4 mph. toward Hurstbourne Tarrant which puts Cold Ash in the shade! Bit stiff the day after but can still walk. During this ride my right knee started to ache slightly and has since been giving me some problems. After a visit to a physio during the week its all checked out ok and seems to be something i need to work through or put up with! I have some gym exercises to do which will help build the muscle up. Started at the local gym before work - 8am to 9am will now be the regular daily routine for the next 2 months. Cold Ash, Pangbourne, Harwell, Didcot, Wantage, Swindon, Marlborough, Hungerford. 76 miles : 5hr 20 mins: ave speed 14.6: max speed 33.1 mph. 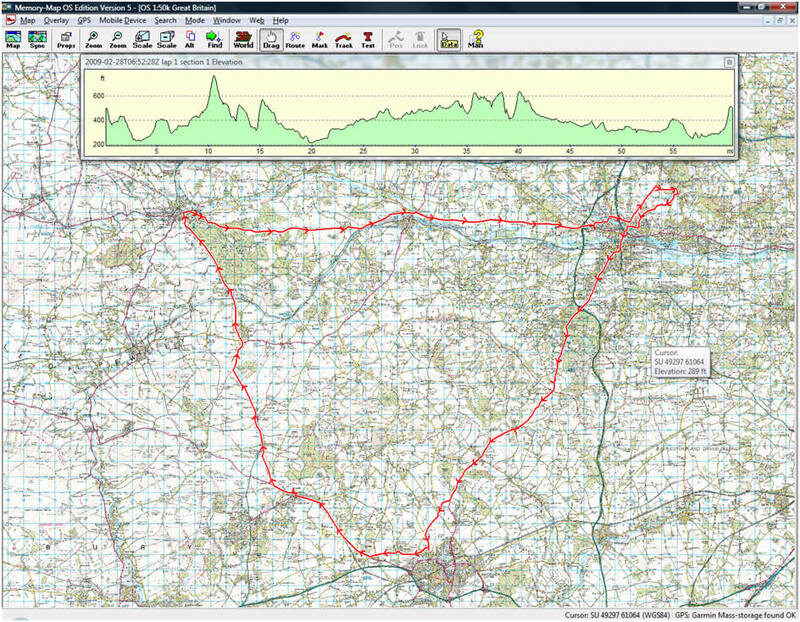 Cold Ash to Wantage all pretty straightforward with good roads, mainly quiet with a 6.15am start. Wantage to Swindon was on a B road which although quiet was very hilly and with a strong westerly blowing in my face for an hour or so slowed the average speed right down to around 13 mph. By the time i had got to Marloborough then the wind was behind me and I picked up good time on the last 20 miles home, averaging around 17 mph to bring the overall average up to something around what i need it to be. Cold Ash, Pewsey (Devizes), Marlborough, Bucklebury. 71.4 miles: 5hr 01 mins: ave speed 14.2: max speed 32.8 mph. 10 minutes before departure my GPS died - this has route maps and directions so very handy navigating minor roads in the country. I printed off the map and stuffed it in my pocket. All ok to Pewsey but with a strong westerly wind it had been hard going, often with speeds averaging 13mph which, for me, is towards the lower end of what I need. The plan at Pewsey was to follow the road to Devizes and then cut up to Marlborough. With several routes out of Pewsey I took the right one but then slipped up and missed a right fork. I ended up across Salisbury Plain with a mega wind in my face and finally turned right at the White Horse towards Marlborough. By the time i had got to Newbury my speed was back to 14.6mph ave but i had only done 61 miles - a "quick" detour to Hermitage, Bucklebury and coming out by the Bladebone pub to finish with the Bucklebury straight to home added the extra 10 miles i wanted. I'm pleased I didn't take off my lights to lighten the load as it was dark by the time i pulled in.! Right knee causing quite a lot of pain both during the ride and this time afterwards as well. Hopefully Glucosamine tablets and gym work will kick in soon. 24 hours after ride my knee is back to "normal". Cold Ash, Pangbourne, Harwell, Didcot, Wantage, Swindon, Marlborough, Hungerford, Newbury, Hungerford, Kintbury, Newbury (and then up and down the road for a few miles to make the 100!). GPS has come back to life and accompanied by Simon J for the ride. Leaving at 6am we made good progress and were only held up by a few minor mechanical issues with Simon J's bike (I should say at this point that it's a borrowed "old" road racer from the 1980's and he'd only ridden it for about 40 minutes the day before!). By the time we got to Marlborough, the half way point, Simon J's bike with is low gear ratios etc had taken it toll and I left him to make his own way back - hats off to him though, he went on to complete 75 miles after virtually no training and an unknown bike - he is going to hurt tomorrow!. Marlborough to Newbury was hard with a head wind and the knee started to play up, arriving in Newbury I turned around (as you can see on the map) and went back to Hungerford (passing Simon J - still smiling -mid way). I stopped in Hungerford for more drink and could hardly walk, the motion of the pedalling though does help - as long as i keep going with a high cadence. Next 10 miles were hard and hurt. Fortunately Dr R had booked me an appointment for the knee at 2.20pm - I arrived home at 2pm so still in a bit of discomfort when I saw him. After all the tests though there is nothing conclusive and the choice is referall or leave it for a few more weeks - I opted for the latter. Cold Ash, Newbury, Wantage, Streatley, Cold Ash. 6am start accompanied by Trevor for the ride. Newbury to Wantage was straightforward with an average 15.5mph. Turning towards Streatley the next 10 miles were a dream with good roads and a strong wind behind pushing us around 20mph for much of the time. Streatley hill is a bit of a monster and my first ascent, nearest so far to getting off and walking!! At the top the tailwind had become a head wind and with light rain towards the end of the ride it reduced the overall ave speed. I'd made a few adjustments with the sadlle lower (to help the soreness! ), shoe cleats further foward and saddle titled forwards slightly. After a few miles the saddle had to go back a notch but otherwise ok.
Clicking on the image below you will see the elevation profile and this was the hardest run I have done so far, not in distance (although it was near to it) but in the hills together with such a strong head wind for much of the route, at one stage I had to change to a lower gear to get DOWN a hill! That said we did have around 6 miles to the west of Lambourne with the wind behind us and cruising at 25+ mph with beautiful scenery and quiet roads which made the head wind "sort of" worthwhile! Towards the end we met half a dozen steep inclines which weren't particularly welcome at that moment but nonetheless the bike handled superbly with near to the actual load on the back - no point in training on a light bike! We had a few quick stops but it was pretty continuous and a great training ride. The GPS tracking paid dividends as I was being watched from home and my dinner was on the table as i came in the drive - very nice! I also had a few text's during the ride which is slightly spooky to think people know where you are! Knee held up more or less but did give a bit of a problem towards the last 20 miles. Same as last time although all a bit later so maybe muscle strength is increasing - physio Tuesday. After a few days of rest with only gym and physio sessions the knee seemed to be doing ok so a quick burst before work seemed agood idea. After about 20 miles though the general pain returned but not enough to make much of a difference - I was just aware if it not being 100%. Traffic was particularly busy and was useful to experience morning rush hour - not particularly pleasant but on the whole a pretty courteous lot of drivers. The knee pain is something I am going to have to learn to cope with and manage over the next 5 weeks. Within just 5 miles the knee was playing up - the usual stiffness and pain! IBU Gel did the trick at sorting the stiffness within minutes and generally controlling the pain. In a way having the pain from such an early stage was good to see just how bad it got. It does seemed to have moved and is now "different" more of a trapped nerve feeling on the inner side of the knee. I am learning that with training I am not actually recreating a "real life" scenario - ok you have the fitness that is improving greatly but I tend not to stop and rest - I know the way and that its a set distance so just go for it with minimal rests. Very important lesson today as I got to the foot of the hill where the arrow is marked on the map (press for a bigger view). I simply hit a wall, my body was craving food like never before, the two water bottles were nearly dry and I knew there was nothing for about 5 miles - and I had this hill to face first. Now, if this had been the "real" run I would have stopped at 60-70 miles to have lunch, replenished the water bottles and so on but I just wanted to get home so had pressed on. I don't know who was looking down on me but I rumaged in my panniers and tucked in a very obsure fold was a very old Mars Bar and a very dry oaty thing - they didn't touch the sides! At that point I'd have eaten road kill in a Ray Mears style I think! The aim was to bring the average speed down a bit to see if that helped and I think it did, over a day it probably looses around 10miles but if I'm comfortable then I'm happy cycling longer and slower rather than be faster with less cycling and being uncomfortable. So anyway the knee to that point was fine, sore and painful but manageable with a few rubs with the gel. Once home though it did seem to get worse - but not the same - so something for Phil, the physio, to check out in the week. Could I do the same tomorrow, and the next day and the next day and..... ? Here I am just before the hunger pains realy hit in - sorry about the music! Just a quick circuit before work, what two months ago, seemed like a long bike ride now seems a lot more manageable. The knee continues to hurt for the duration although the pain has moved. I am convinced it is the bike set-up, a few mm adjustment somewhere that on a short ride is not noticeable but on a longer one causes the pain. I continue to tweak here and there in the hope that I can get it right! Phil's physio treatment on the ITB I am sure has eased the original complaint and I am now stretching and warming up and down a bit more seriously. A very wet start will full waterproofs tested for the first 10 minutes until it stopped - they do work at least! Good average speed over the distance and for the first time in a few months NO PAIN! The knee still had some of the previous but nothing like as bad as before and nothing direct so that probably helped the overal speed of the ride. Continued today with a relatively high ave speed and again no pain so something has worked - whether its the tape on the knee, the adjustments to the saddle or cleats I do not know. I need to do a >100 miler in the next week to be fully sure. Bit warm so need to think about what i wear in between the base layer and jacket so I can peel off a layer. 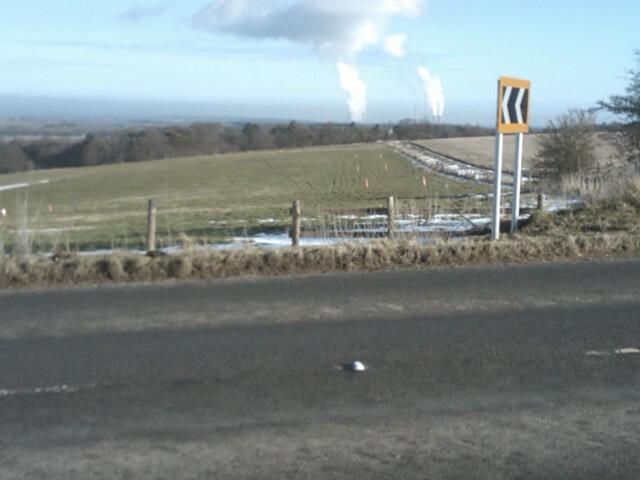 Cold Ash, Kingsclere, Andover, Devizes, Calne( just west off), Marlborough, Newbury. Not a good start with less than 6 hours sleep, but with the sun rising a great time of day to be up on Watership Down. No noticable affects from yesterdays 60m ride. Some great hills and lovely views but overall a tough ride for me. Strong easterley wind which we met head on between Devizes and Marlborough - this increased knee pain and I struggled to get over 10mph for about 10 miles. Couple of 10 minute stops here and there and eating mostly as we cycled - this is my preference rather than taking a long break and ending up with stiff "cafe legs". Quite a quick recover after finishing and another 20-30 miles would have been easily achievable which is what will be needed in a few weeks from now. 22nd April 09 - Banjo Bikes in Newbury BG FIT assessment. This is a 2-3 hour bike fitting session that adjusts every adjustable part of the bike to fit the rider. I signed up to it in an effort to reduce the knee pain. The next two rides will see if it has helped. A short 4 and 11 mile ride seemed very comfortable so fingers crossed. Light wind and nice ride - no pain and very comforatble so hoping for the same on Sunday when we go to London on the last long ride. Cold Ash to Westminster, London - via all sorts of places! 6.30am start on a fantastic sunny Sunday with the mist rising over the village! This really is the best time to be out with barely a thing on the road, fresh legs and clean air. We headed east to London navigating with the GPS through Reading, Twyford, Windsor, Staines and then into London. 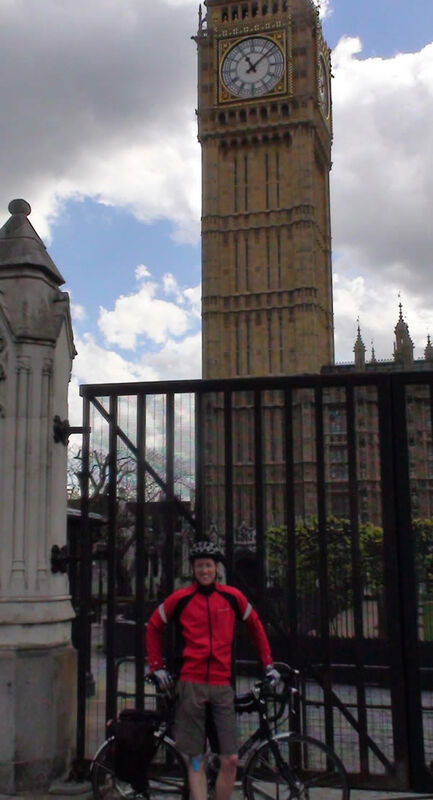 It really was quite wierd cycling up the Embankment - we were at the House of Parliament in about 4 hours (I recall a bad traffic day years ago when it took me longer to drive there!). The London Marathon was one and we'd gone to see Emma and Lizzy running - not a chance of seeing them but we saw a few awe inspiring wheel chair racers. After 30 minutes or so we headed for home stopping for a quick cake and hot chocolate. Our food intake is somethging we need to work on - quick food is ok but too much sweet stuff just leaves a horrible taste in the mouth and doesn't really fill you up. Next time it'll be a bread roll or something more filling. We arrived home at 4pm, 9.5 hrs after leaving and having covered 121 miles of relatively flat terrain - its not called the Thames Valley for nothing I guess!. Emma and Lizzy both made the 26 odd miles - so congratulations to them and the money they raised for their charity. And the knee? Well a combination of physio, good strapping, bike set-up and goodness knows what else gave me a relatively pain free ride. I am highly tuned to anything odd on my knees now so probably pick up things that are nothing - but this was the best yet! That'll be the last long ride, a few more shorter before and maybe a bit of swimming but I need to spend a bit of family time (if they still recognise me!) before the 12th May. Just a short 26 mile ride with Trevor. We were playing with the video camera so lots of stop / starting with a very varied pace from fast and slow. I'm aware I need to get on with many things at home that have been neglected over the last few months and with just two weeks to go I have decided to ease off the longer rides, the knee is more or less behaving itself so the rest can't do it any harm. Between now and the 12th May (our departure date) I'll cycle to work most days which is a short 3 miles and then 3 days out of 5 will take a countryside detour home which is around 10 miles. This should just keep the legs active.